Sauces by McGirk's Irish Pub - Mustard, Whiskey BBQ, Hot Sauce! 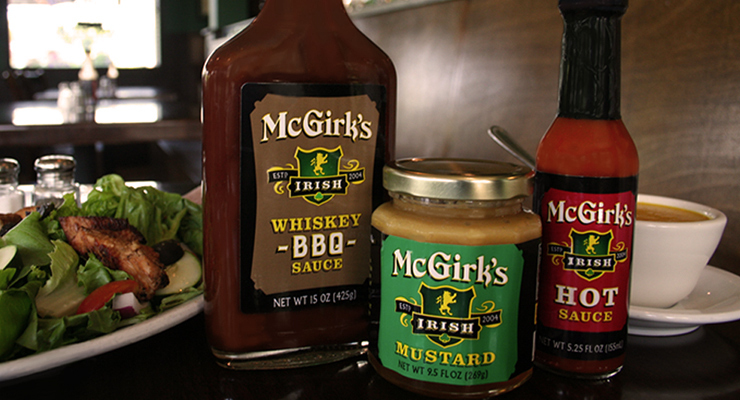 Did you know McGirk’s Irish PubÂ makes sauces? If you’ve been to the pub, you’ll know we use them in many of our menu items! McGirk’s Irish Mustard has a great surprise kick to it yet sweet – pretty great dipping sauce to go with ourÂ Pretzel Bread or cheese and crackers!Â We make a kickin’ sauce to drizzle over our Buffalo Egg Rolls using our McGirk’s Irish Mustard. One day our staff was experimenting with makingÂ a special BBQ sauce for a special occasion. We entered to win the NYS Fair Best Burger Competition. Â Thus was born McGirk’s Irish Whiskey BBQ Sauce and to adorn the Irish Whiskey BBQ Burger, oh and it’s on ourÂ our Irish Whiskey Chicken Melt too. So guess what, you can buy any of these sauces right at the pub! McGirk’s Sauces are made and bottled right here in the Southern Tier, yeah for BUY LOCAL! We have some really great recipes that will be posted here soon using our sauces from our outstanding cooks, but don’t wait for us!Â Start creating and share your favorite way to use McGirk’s Irish Mustard, BBQ or Hot SauceÂ on our Facebook page. Out of town? E-mail us and we can certainly ship to you!